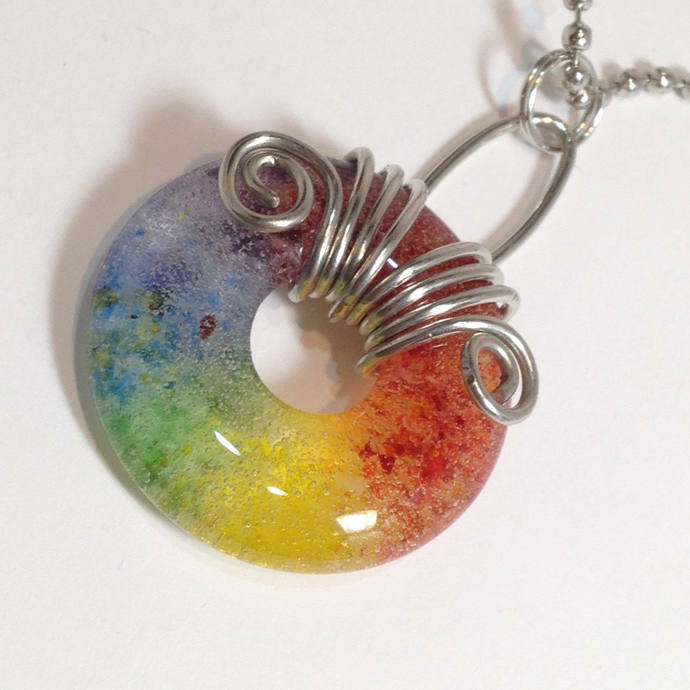 This Rainbow Donut Cabochon Pendant is created by layering glass frit in hues of Red, Orange,Yellow, Green,Blue and Purple into a mold to create a donut and then melting to 1425 degrees in a glass kiln. Bead is approx. 1 1/2" in diameter with a 3/8" hole. This one has a delicate effervescent 'bubbly' effect. It's embellished with Silver toned Wire work. Your choice of chain or cord as listed in variations. GIFT CERTIFICATES are also available in any denomination upon request. All of my creations are all designed & individually handcrafted by me. I like to keep my hands busy & love to work with Glass. I find Magic in the way glass magically transforms light & color into a visual dance and how clay can be manipulated into so many forms and structures.